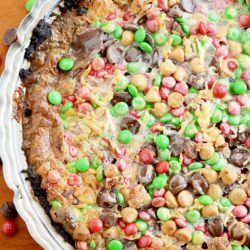 A thick, buttery chocolate sandwich cookie crust with chocolate chips, butterscotch chips, pecans, coconut, pecans, and M&M’S®. A classic holiday cookie in pie form. This post is brought to you by my friends at M&M’S®. A traditional Magic Cookie Bar (or 7-Layer Bar or Hello Dolly Bar) has a thick, buttery graham cracker crust. On top of that are layers of pecans, coconut, chocolate chips, butterscotch chips, and ooey, gooey sweetened condensed milk which gets all caramel-y during baking and magically binds everything together. Chocolate Cookie Crust. CHOCOLATE COOKIE CRUST. Do we really need any other words here?? I love the crust switch up in this pie from the traditional graham crackers to chocolate sandwich cookies. 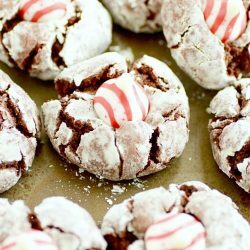 It adds a depth of flavor (more chocolate!) and a crispier texture which pairs well with the soft filling. M&M‘S. A few years ago I made these Monster Magic Cookie Bars, and (despite the horrible photography) they exploded on Pinterest. That was the first time I added M&MS to this recipe, and I never looked back. 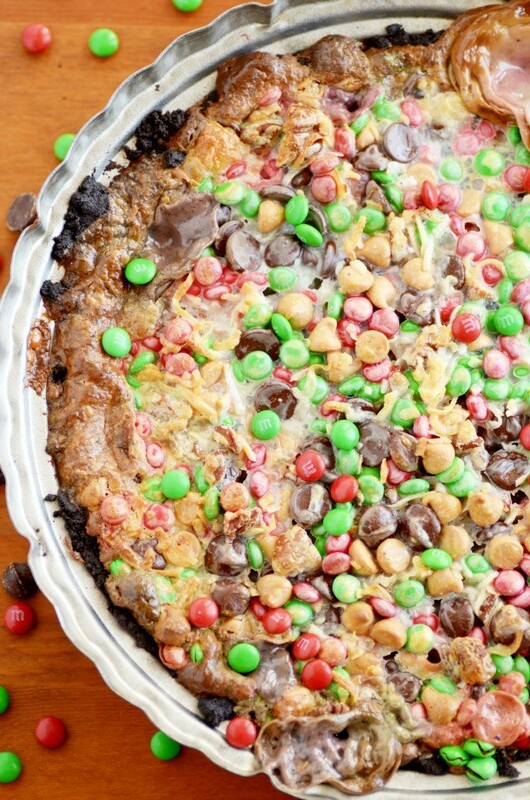 M&MS make everything better, and Magic Cookie Bars are no exception. 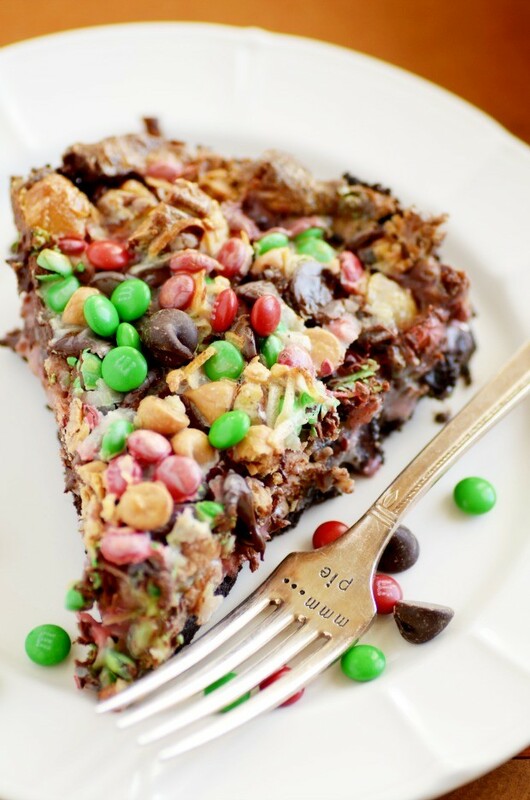 If you’re looking for more yummy M&M’S recipes, check out their new Pinterest page! PIE. You guys, it’s a pie! A huge, deep dish, fully loaded, in your face pie. If that’s not an improvement on the original bars, then I don’t know what is. First. Make the crust by crushing the cookies and mixing with a little butter. Having a great food processor is really handy for this part, but it’s not a necessity. You could also just smash the cookies in a ziptop bag. Then start layering! 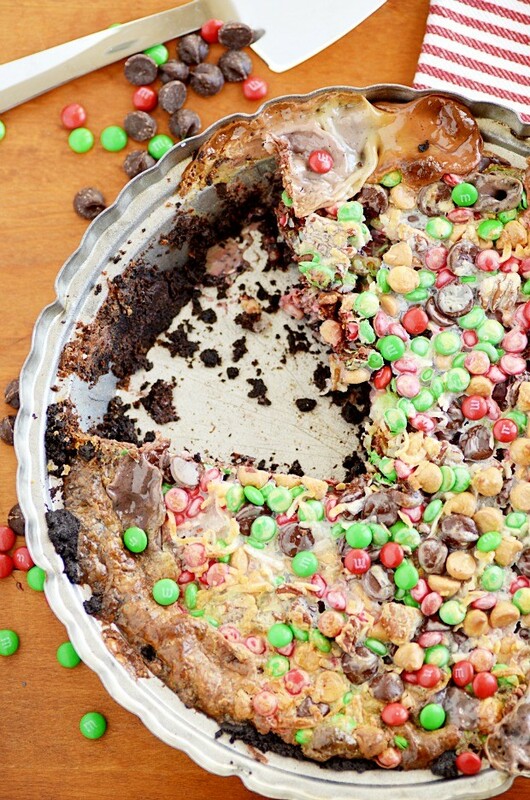 Cover up that crust with butterscotch chips, chocolate, chips, coconut, pecans, and M&Ms! Pour the sweetened condensed milk over top. Mmmmmm. Be sure to lick your fingers. Bake it up and then let it cool. This is the hardest part– waiting for it to cool! But you want to wait, TRUST ME. Otherwise, it’s impossible to cut, and you’ll be left with an ooey, gooey mess. Albeit a delicious mess. Voila. You’ve just made a pie so good, people will cry. In a good way, of course. A thick, buttery chocolate sandwich cookie crust with chocolate chips, butterscotch chips, pecans, coconut, pecans, and M&M'S®. A classic holiday cookie in pie form. 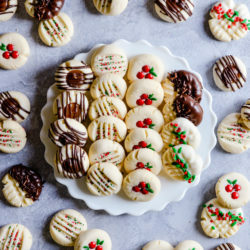 Crush the cookies into fine crumbs, either in a food processor or by hand with the cookies sealed in a large ziptop bag. Mix together the cookie crumbs and the melted butter. Firmly press the crumbs into a 9-inch pie dish, making sure to press the crust up the sides of the dish. Bake for 8 minutes, and then let cool completely before filling. 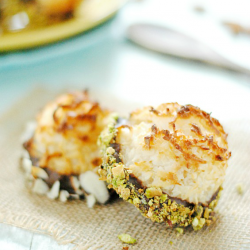 Add the layers of butterscotch chips, chocolate chips, coconut, pecans, and M&M's. Pour the sweetened condensed milk over top. Bake for 30 minutes. Let cool completely (at room temperature for about an hour or in the refrigerator for about 30 minutes).